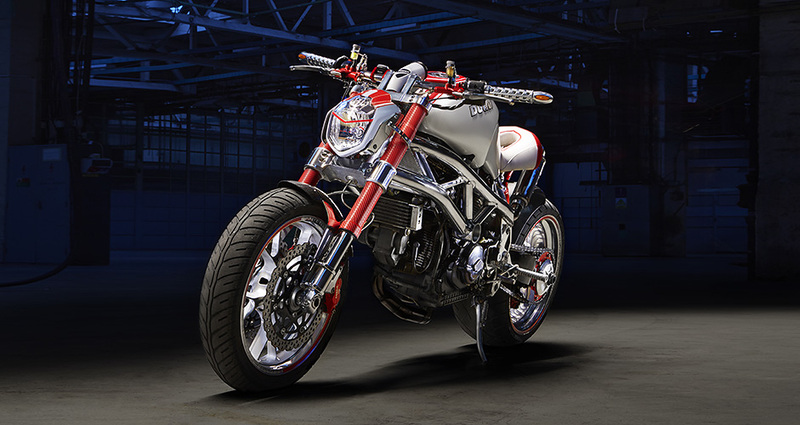 Ducati Cocaine is moto-construction with Ducati Monster 1000 engine, which was used as a basic component for this beauty. This simple air and oil cooled, two-valves twin, without water cooler system was perfekt choice for this moto-construction. Originaly is this engine designed for S4R and ST models from Ducati. The frame is welded from aluminium tubes with diameter 50mm and cruiser´s wheelbase. Fully adjustable fork Brembo from Ducati SS taking care about front suspension, rear swingarm was used and reworked from Honda VFR. Also all breaking system Brembo was used from model Ducati SS. Back wheel from BMW 18x9,5“ was one of the most difficult things at this moto-construction. About the other components like handlebars, crampons, gear change, glasses, exhaust system, seat and so on, they were designed specially for this moto-construction. Final design is polished aluminium with red and white metallic colors. Ducaty Cocaine is next moto-construction from NAVEL FACTORY, what you can not ussualy meet on the road.